Hiya guys, how's it going today? It's the start of my Spring Break, but this is a weekend where I will be spending time with my family. Here's to us getting along and not trying to kill each other by Sunday night, haha. For today I have some swatches for a recent purchase I made for the Neon Duo by Love, Angeline and Polish M. When they went on sale I had my last twenty dollars in the bank and knew I had to get them... even if it meant no lunch at work for two days haha. Oh the struggles of a polish addict guys. 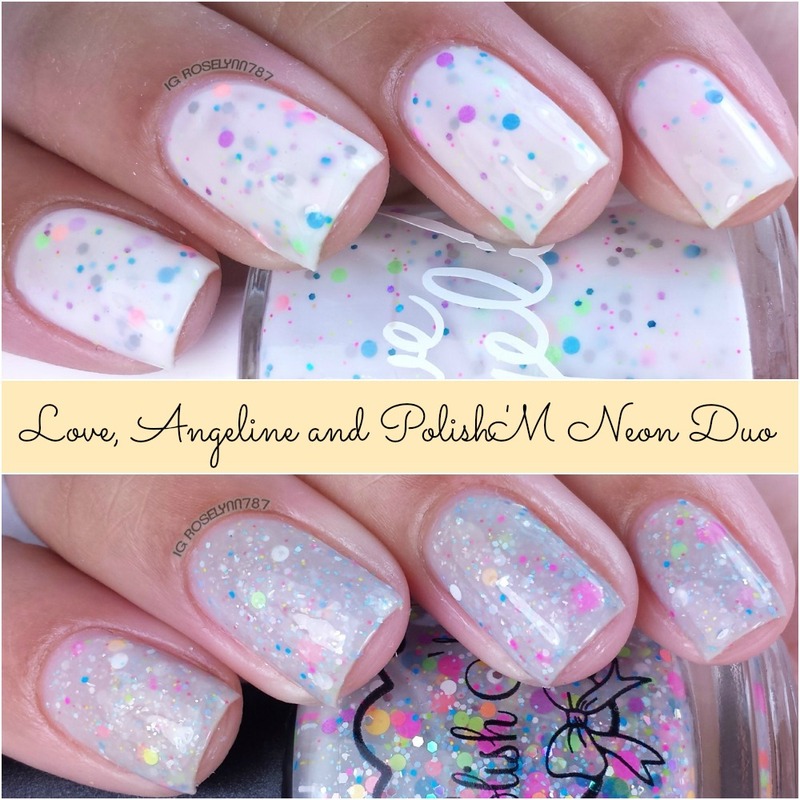 The Neon Duo by Love, Angeline and Polish M is currently sold out. There was only 25 sets of the duo for sale, so you can imagine how quickly they went. I'm not sure whether or not it will be restocked, but if you're interested it's best to join their fan group pages so get the latest scoop. Links available at the bottom of the blog post. Neonsense is a grey crelly with neon dots, scattered neon & pastel hexes, white dots, white micro flakies and silver holo glitters. The grey is such a cute offset to the colorful neon glitters. If there is one thing I know Polish M for it is the excellence in formula when it comes to glitters. The consistency is fantastic and applies so smoothly without the need to worry about glitter buildup. The glitters glide off the brush effortlessly. Needless to say, there is no having to worry about glitter fishing. For these swatches, I used two thin coats and a thick layer of Seche Vite topcoat to smooth down the glitter mayhem. No Dot About It is a white crelly with neon dots, blue and pink holo glitter, and matte grey accents. Even though I'm a huge fan of white crelly polishes, they always make me look a little tan don't you think? That's probably why I love them so much, because I don't look like Casper the friendly ghost finally haha. The neon glitters in this are perfection and make it look like a funky and colorful splatter mani without the hard work. Formula and consistency were pretty good, but very sheer in the first coat. I found that working with really thin layers allows for a better application and for the glitters to spread evenly. For these swatches, I used three thin layers and sealed them off with Seche Vite. Overall I'm so happy that I was able to purchase this LE duo because it's all about the neon babes! This was also my first time trying the much talked about Love, Angeline and I was very pleased with the formula. I do think the crelly formula for the Polish M portion of the duo is slightly superior in application, but I am still satisfied with both of them. As I mentioned before, I'm not sure if this duo will be restocked but your best bet is to join the fan group pages to keep up-to-date. Both makers have created really fun communities on Facebook for us all to interact so there is no reason why you shouldn't join. Even a hermit like me loves being able to share my manis and get to know other polish ladies. So guys what do you think about the neon duo? Do you want to see it restocked? I have this duo on its way to me! I'm loving the neon glitter in both polishes. :0) So bright and pretty. These polishes look amazing! I'm loving all the cool polish looks I'm seeing around now.It's so much more fun than plain solid colors. 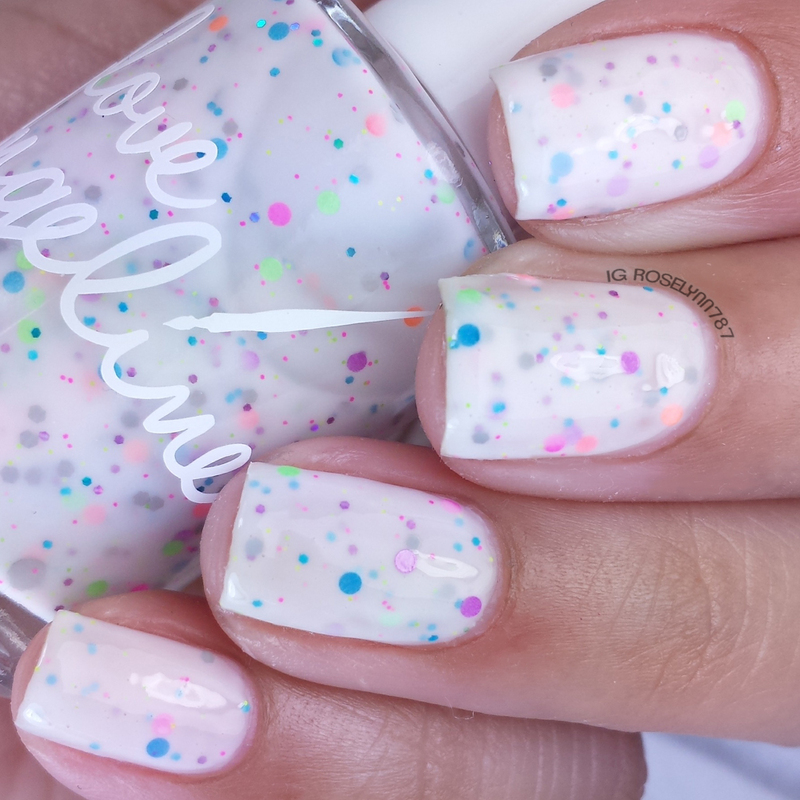 No Dot About It is my favorite, white with neon glitter is so pretty! These are so much fun! I totally hear you about skipping lunch for LE polishes lol! Nice! Its so pretty! I really need to let my nails grow so i can do this! They're both really pretty! Shame they were such LEs. These are so gorgeous! I need these polishes! What can I say, you always have the most beautiful designs of nail polish. As always, you have beautiful nails. These are such cute designs, I love this a lot! I'm all over that No Dot About! I even think it'll look good on me! I'm not the biggest neon fan actually, but that white crelly is something I could wear! No dot about it looks amazing! Both are pretty, but I kinda like No Dot About It more. Too bad, I can't even last a day with long nails. The polish looks lovely with long nails. These are so spring like and adorable. I'd love to polish the girls nails with these, I wish I had them in time for Easter service tomorrow. It would look so cute with their dresses. These are gorgeous...and perfect for spring! wow I love the duo and would definitely want to see them restocked. Wow - again you've inspired me - I will be taking a better look at how and what I use to make my nails - more dotty beautiful! even on my nails! No Dot About It is so cute. It reminds me if vanilla cake and frosting with sprinkles! I wish nail polish would stay on my nails. No matter what I do it peals a few hours later with every brand I have tried. They are both so beautiful!! 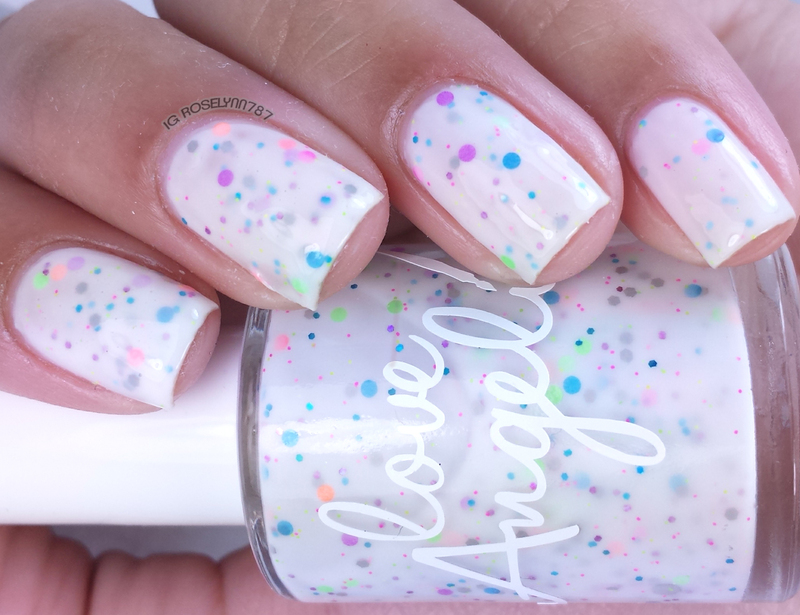 I love neon glitters in white crelly polish! The struggle is real! ;) Love both of these, I can see why you grabbed them up! I just got my nails done and I am always looking for some pretty nail designs. Thanks for letting me know about these! I really love the No Dot About It! I should have ordered them and I didn't....I hope they restock! This is so pretty for the spring and my 4 year old will love this! No Dot About It is lovely!!!! That's so pretty. I love the design. Now I'm wanting to pretty up my nails! These are so pretty! I wish mainstream brands would come out with more polishes like these. Your swatches are fabulous. I kind of need these now. Especially that Polish M.
These both look like really fun polishes. It's hard to believe that back in the days, nail polish just came in solid colors, and once limited to reds and pinks and neutral colors. Now, you have all types of fancy options – love the creativity that I've been seeing over the years with nail artists as well! Oh my goodness! The "Love Angeline" is perfect for today ... it just screams Easter eggs! This is interesting. I'm sure one of my sisters would appreciate this post. I will most definitely be sharing with them. I really love the pastel colors you chose, especially for Easter! I would love to give these a try with my girls. Both of these are so gorgeous! I adore neon glitters! I love the colorful specks of vibrant color in that polish! That looks a lot of fun and I need to try this shade when I go out next! I certainly love those polishes. They are all pretty and bright. And gotta love those dots. I love both of these on you! I'm in a NEON all the things mood in hopes that it will bring summer faster. These polishes are adorable!! I love a good confetti polish!! This nail polish is so cute! I love all the different colors in it. It looks super fun! I am a big crelly fan so I am LOVING these!